Topics For Discussion: What Is Integrity? What is integrity? Most people think of integrity as being the same thing as honesty. Is the person telling the truth, can they be trusted etc. But if you think of integrity as consistency, where your actions, values, thoughts, and feelings all line up would you consider yourself to have integrity? In our modern day to day world, I find myself challenged to be consistent in many areas. I am an honest person, but sometimes my consistency may be somewhat lacking. With the barrage of things to do and the unending stream of phone calls, e-mails and meetings, it’s hard to be consistent. I find myself making excuses… the meeting ran late, I couldn’t get off the phone, or the perennial favorite… there was traffic. There are too many things to do and not enough time to do it all! I sit in meetings all the time where people roll in five ten or even fifteen minutes late on a regular basis. The excuses get old, and you quickly realize that the meeting was not a priority for them. Each excuse erodes my confidence in the person who is tardy. Unexpected things do come up, but someone who is always late loses credibility quickly. 1. 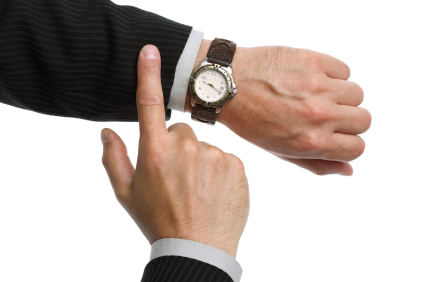 Projects: Why do things always take twice as long as you expect? I have found that I naturally underestimate how long a task will take. The little interruptions mount up… the phone call here, the e-mail there, and the over schedule of meetings and suddenly the project lags. If you are counting on others to help out, the effect of interruptions will only increase and your integrity as a project manager may be challenged. An important thing to remember is to Under-Promise and Over-Deliver. Unfortunately our project list may be out of our hands and we’ll need to find a way to be more productive. The best solution I have found is to work in a focused manner. Single-tasking can really be your friend. In my article entitled, The Power of 48 minutes, I cover some strategies for working this way hour after hour and the benefits it provides. 2. Communications: You never e-mailed me back or returned my phone calls… didn’t you get my message? Have you heard that one before? We all get barraged with an unending stream of e-mail, phone messages, and snail mail. I have found that setting a rule in Outlook helps me quickly identify e-mails from important people. I just set the rule to color the heading text of the incoming mail from people on my project team. It’s a quick way to identify action items in the sea of messages. 3. Time Management: When there is too much to do how can you handle it all? I’ve found many solutions using David Allen’s great time management system, Getting Things Done. From using a pocket organizer like a walleteer, to organizing my next actions, David’s system is a big help. But one of the most effective solutions to become more consistent is to plan out your day and arrive a few minutes early to each appointment or meeting. Mike St. Pierre has a great post on six great reasons to arrive early over at lifehack.org. From getting the best seat to having time to grab a cup of coffee, you’ll find some useful solutions here. The bottom line.. If you arrive just a few minutes early your credibility will increase. Do this consistently and you will find there are many many unseen benefits to this strategy. Integrity is just one of them. The basic assumption here is that “integration” or “wholeness” of character is a necessary component in order to reach one’s personal and professional potential, and that character is something we can change. This book is informative and inspirational. It is a roadmap to success. Highly recommended! 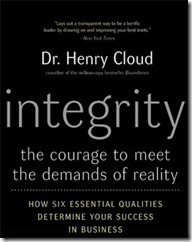 Overall: We need to ask the question, “What is Integrity?” and apply it to our lives. I would love to hear your strategies and solutions. Please leave a comment.